MBC: Mummies night in...party on the cheap! It's been so long since I've posted anything party related! Unfortunately all our our family birthdays are crammed into the winter and mixed with holidays. With me being a party lover, baker guru and holiday extremists (lol) it kinda makes me a bit crazy starting about this time of year. Normally I get the chance to host a party over the summer but it just didn't work out this summer. Bummer. 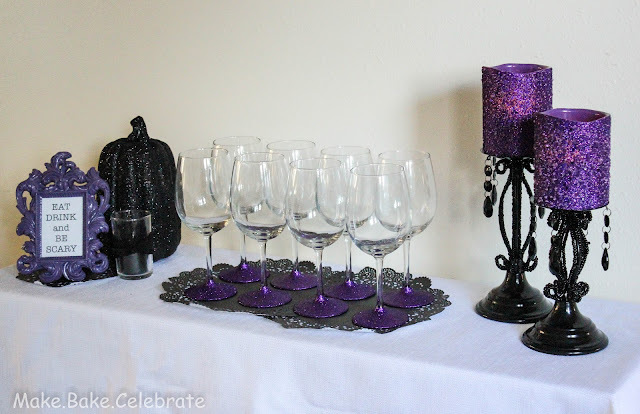 So when I decided to have a thirty-one party recently I couldn't resist to take the opportunity to throw a spooky ladies night while we were all gathered up anyway. Mummies night in, if you will ;) It was seriously a blast, I think mommies night in/out should be mandatory at least bi-monthly. A few hours of giggles, chit chat, serious convo, games, snacks, and wine was exactly what I needed. Just a few hours away form the kiddos and a great chance for daddy to take the girls on a date. The next morning I woke up so refreshed and ready to play with the girls...I actually missed them! Being a military family we live far away from family...and moments away from the kids are kinda rare. 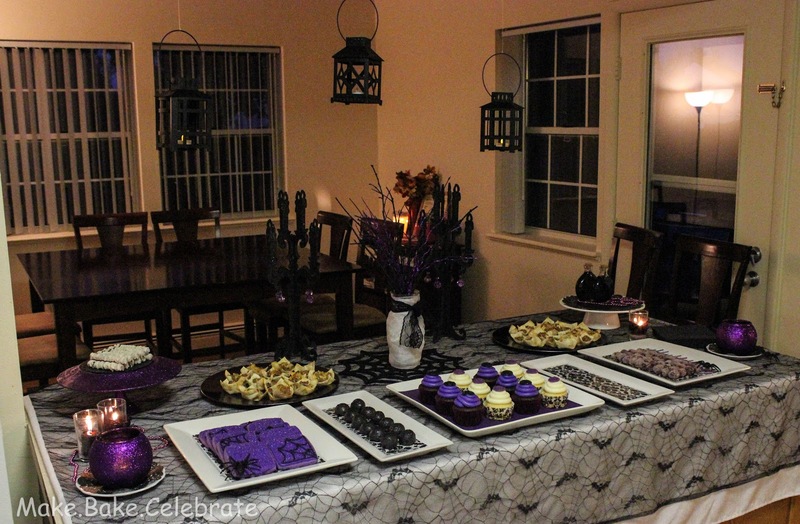 The party went over really well and I love how it all came together. 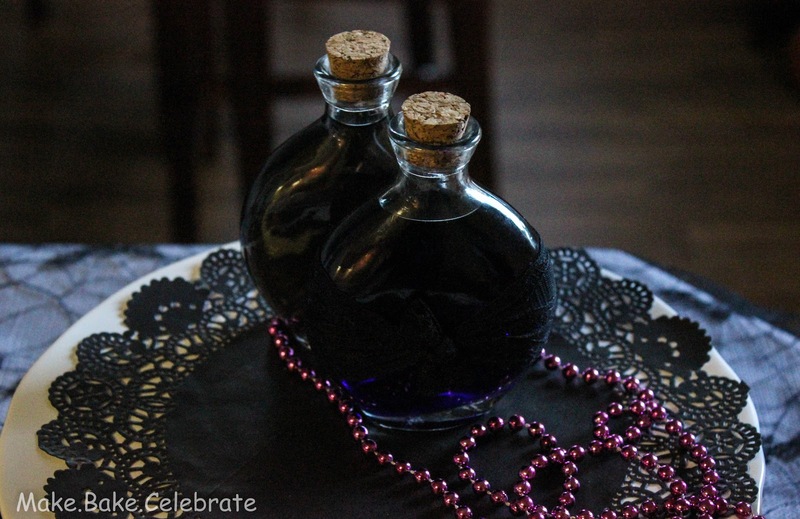 I thought I would inspire you to have a "grown up" party and show you how to throw an easy and yet adorable bash on a budget, while showing you some of the things I included in Mummies night in. 1: Shop your house first - you will be SO surprised at what you can find right around you home that you can spruce up to fit your party. 2: Check your local Dollar Tree, Target dollar spot, and Wal-Mart holiday/party aisle! You will be shocked at what you can find for often a few bucks or less. Keep an open mind....somethings can be easily changed with a coat of spray paint, glitter, ribbon, etc! 3. Take time to plan your foods well. Food is always way more expensive then you think. I try to sit down and plan food that can be made easily, will coordinate, won't cost an arm and a leg. Remember if you making lots of different food...you might not need a lot of each food then. 4. "Invest" in party ware. This is a good idea if you love to trow parties. Several years ago we purchased nice plastic white plates from Party City. They can be purchased for about what you would pay for regular party plates twice sometimes the same price even. We now have quiet a stash of them which I keep in a plastic bin in the garage (saves room in the kitchen!). I haven't bought paper plates in several years...and they look much nicer! 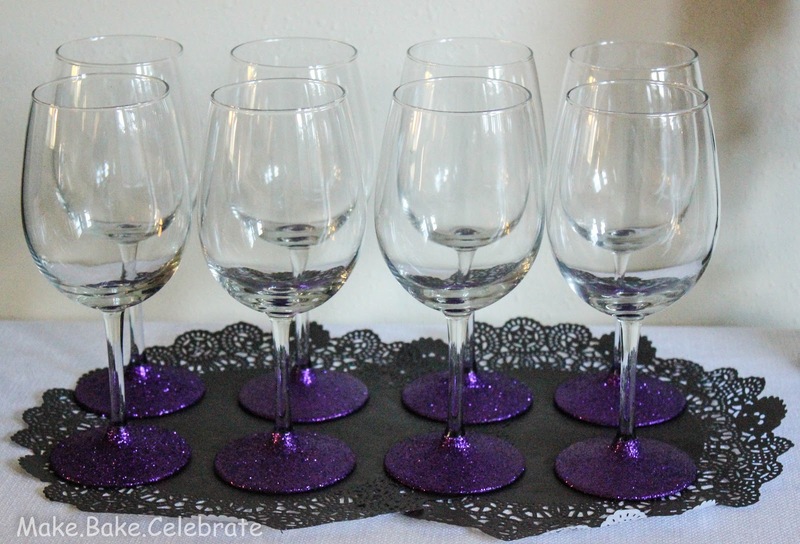 You can do the same with glasses, silverware, serving trays. act. When we are planning a party I ask the hubs to bring in the party bin and I have lots to sort through and pick from. Big money saver. I have also purchased white linens on clearance that I use all the time along with white serving trays from both Target and Wal-Mart. I know white can be boring but having white plates, linens, and serving trays makes it so easy to match everything! 5. Use reusable items. If possible purchase items that you can use again. This comes is especially handy for holidays. You might buy a wreath for a Christmas party...then later hang it on your door! 6. Hit up your craft store and for cheap "tid bits" to help decorate. I will often pic up random items like scrap booking paper, ribbon, twine...etc at a craft store for cheap even if I have no idea exactly what they will be used for yet. I always end up something that needs bows, or buttons, or something special. Don't forget to go through your own craft supply and take coupons to your craft store! For this party in particular I really wanted to go low key. I already had lots on my plate and only a few days to plan. I spent about $50.00 total and took about 1 day to put together. 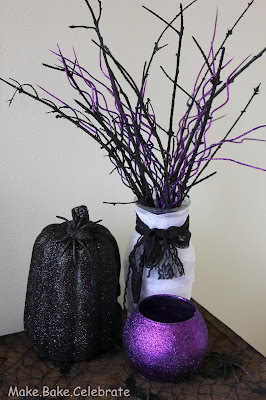 I decided on the colors because I love the chic look of purple and black and since it's so in right now I was able to locate lots of matching items in the dollar spot and on clearance at the craft store. Micheals had lots of purple and black party stuff for half off and I had an additional 20% off coupon! Whoot! 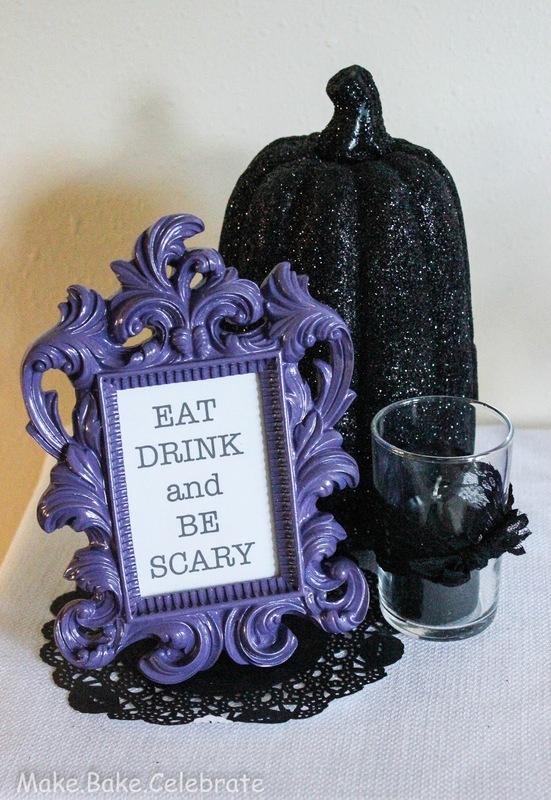 For our "drink station"....I was able to use a frame I already had and typed up "EAT DRINK and BE SCARY" to put in it. The pumpkin came from the Target dollar spot, and the candles were my sales find from Michael's. Wine and sparkling grape juice were added later of course. My favorite part was the glittered wine glasses. 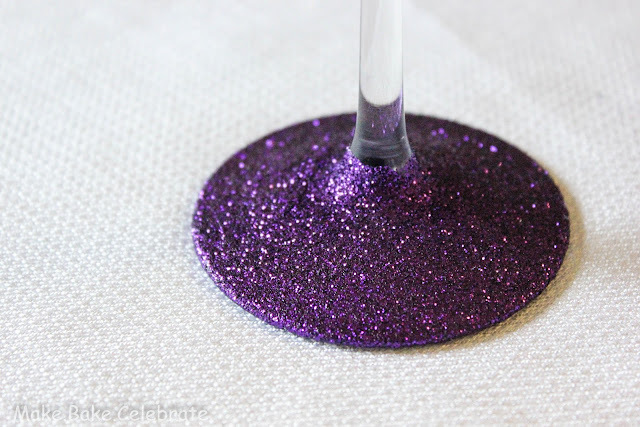 I have seen this floating around Pinterest for awhile now and I've been itching to try it! It was SO easy! I had so much fun glittering these...I had to find other things to glitter. I mean hey I had extra glitter, hello! The Purple Pug would be proud! Remember craft stores are a season ahead. So scoring cheap holiday items in the same month are pretty easy. 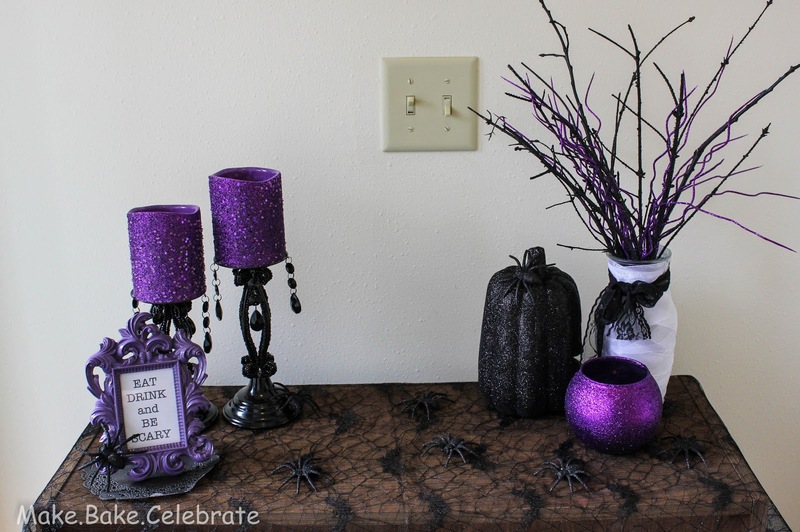 I wanted to keep it so low key I didn't even set up tables and take time decorating...I used a large island and decorated as I went with the supplies I had gathered! Only problem was it wasn't easy to get a nice photo of it this way...oh well :). 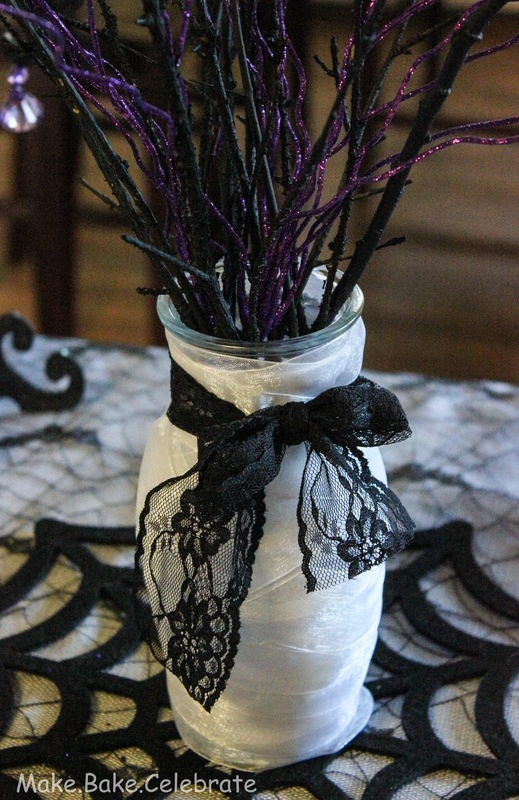 The centerpiece was just twigs spray painted from our back yard and .30 glittered sprigs. I wrapped a vase I had in "mummy" wrap and tied some black lace. 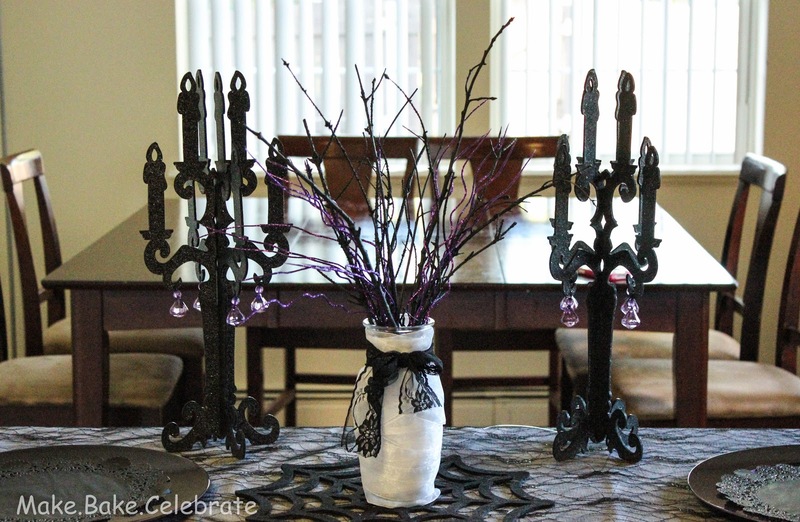 The awesome candelabras were from Michaels. which I scored for like 3.00 bucks...I couldn't pass them up for that. They were much cooler in person. I placed lots of candles around to give a warm spooky glow. 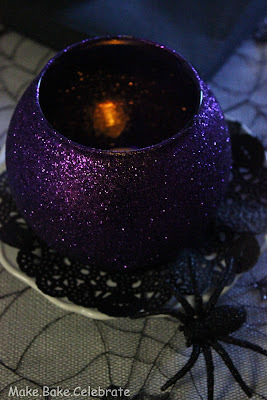 I glittered the purple candle holders...I heart mod podge. I kept the desserts and food simple yet yummy! 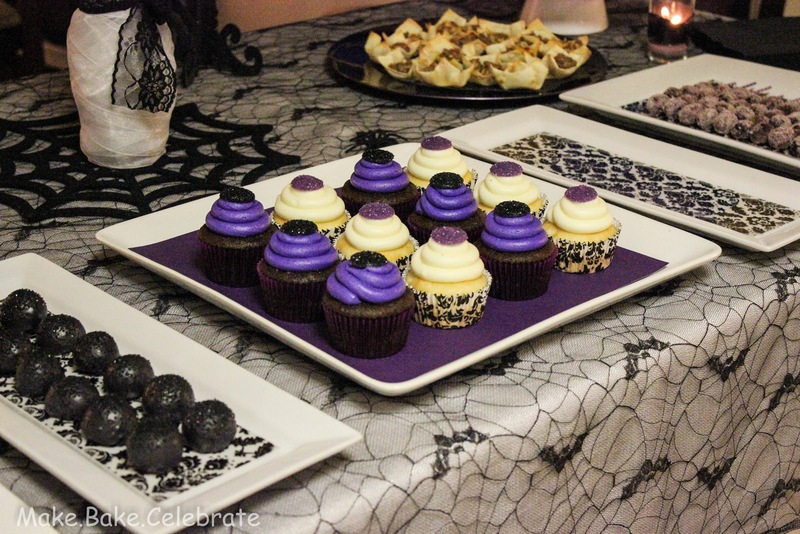 White chocolate cupcakes and devils food with buttercream cupcakes. Purple sugar cookies, royal iced and covered with sprinkles...I added just a but of "web". One of my favorite new treats! 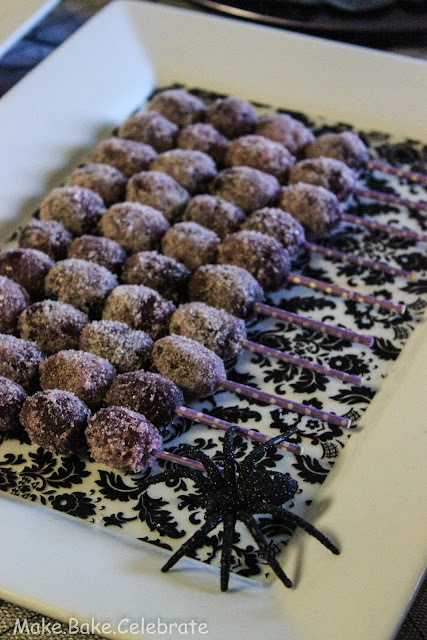 Grapes rolled in dry jello! I added a kabob stick with some washi tape to make them a bit more festive. 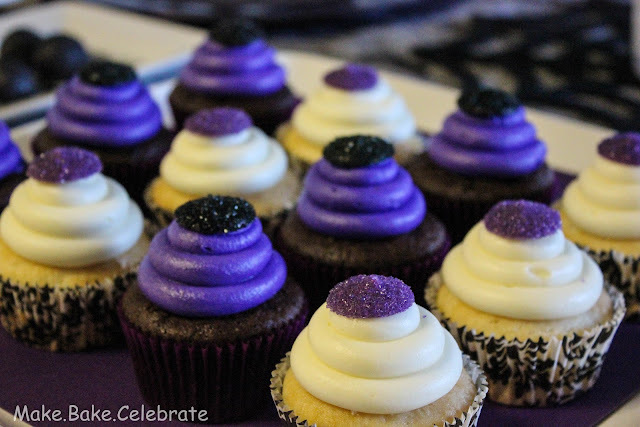 These were a huge hit. 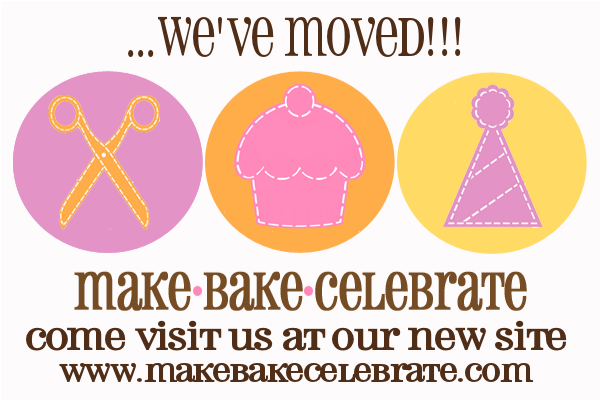 Again using things I already had to spruce stuff up! 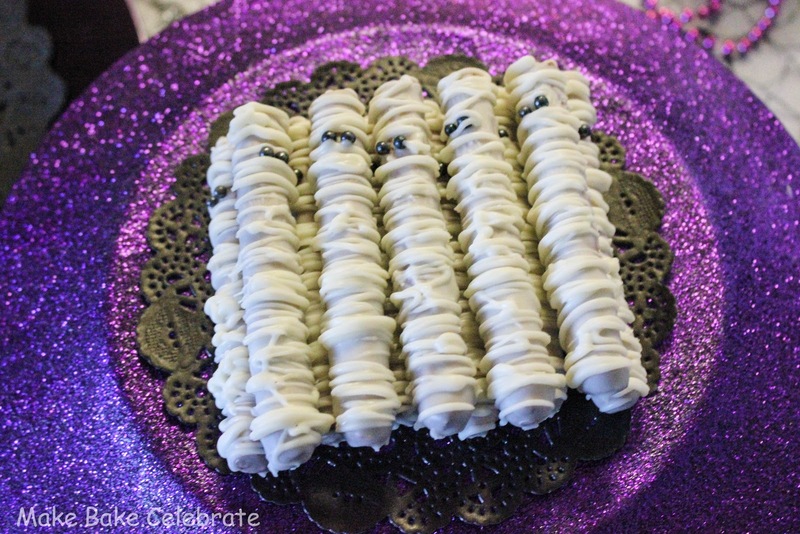 Chocolate covered mummy pretzels with sprinkle eyes. 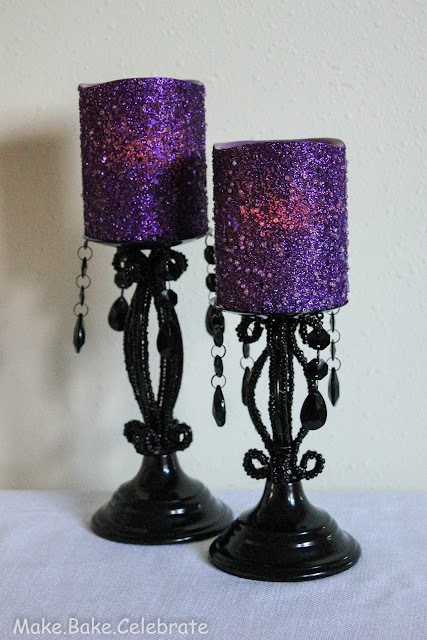 Pst...I made and glittered this stand. 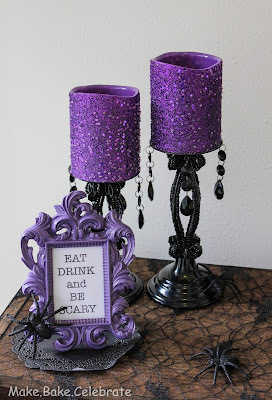 Candlestick + plate + E6000 + mod podge + glitter + clear sealer. Love it. Here's another helpful trick! I love to line my white plates with scrap booking paper. 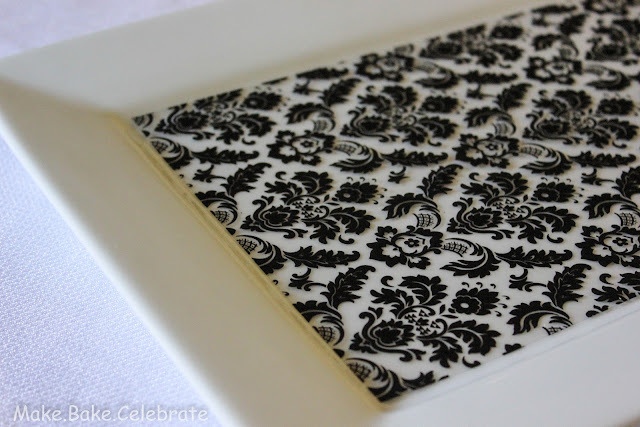 A very easy and cheap way to spruce up the white plates and help decorate the table. These were clear plastic sheets found at Michaels...which made them washable too! Oh and they make clean up a breeze. I also served Oreo truffles, sausage wontons, quesadillas, and chips and warm chicken dip. For drinks we had several different wines as well as sparkling grape juice. Since there would be lots of ladies that didn't know each other I wanted to get things started with some cheesy games. 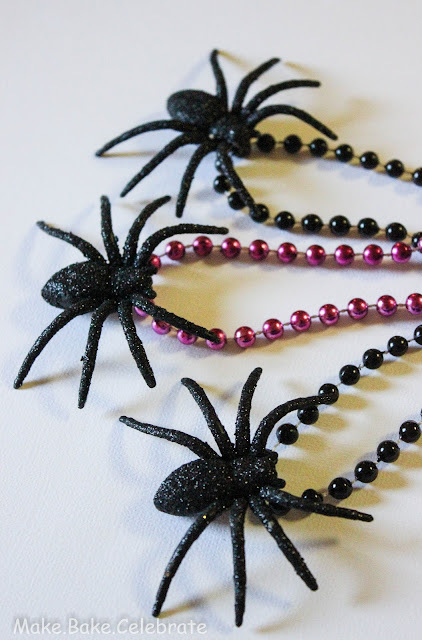 For the first game I glued some spiders to some cheap beads I found for 1.00. The way the game works is each lady got a pair of beads and then we picked a forbidden word. If you said that word and somebody caught you they got to take your beads. The lady with the most beads at the end of the night wins! We played this at my baby shower with clothes pins and it was so much fun..using the word baby of course. For our ladies night we used the word bag since we were looking at and talking about 31 bags. This game can easily be changed and it's so much fun! And the best part about it all...as soon as ladies night was over I moved many of the pieces to our entry way where I decorate for each holiday or season. I didn't mind buying these pieces at all since I knew they would get more then one nights use! Love doing stuff like this! 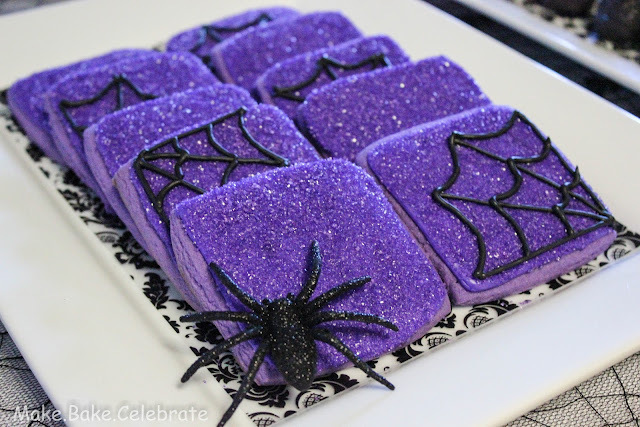 Do you have any awesome party on the cheap tricks? Please share! I hope you've been inspired to thorw a fabulous (and cheap) party! Maybe even without the kiddies ;).